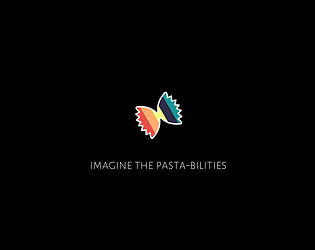 A narrative-driven pasta-based operating system experience. I don't want to spoil anything, but It's about publishing a game. It's also a parody of commandline tools. Must have sound on to play. DEAR DEVELOPER, I found out how to get into the secret folder, and im wondering whether the game is just scaring me, or whether its actually "eliminating competition" I am scared to continue on this route because of this one moment in the game, I need to know. Ive tried finding videos to see if it actually does this but there arent any. I'm not sure what you mean. I never looked in that folder because Joey told me not to. Farfalle OS is just a fun game where you follow Joey's instructions to help him publish his game. Hope that helps! To those coming here late, the newest version of the game has been posted, and has removed the bug that causes the game to crash for some users . Congrats! I've gotta try this one out. Amazing voice work and food puns! Nice work! The food puns are hilarious, and the implementation of the console is absolutely solid. Would love to see you making more games in this style. I'm a huge fan of Hacker Evolution, which this game reminds me of. Would have liked more freedom to explore and discover things at my own pace rather than having to listen to the voice. A button to replay clips would be nice, because I got stuck at one point. No game breaking bugs, and solid gameplay overall. Great job! That was a big disappointment. I'm definitely going to go back to play this again! Great work man, so much better than ours and DEFINITELY not the same game! Can you message me on discord or here about what crash you had. There should be no issues when baking. Are you playing on windows? I've updated the game, and am 99% sure the crash bug is gone! I wish autocomplete with TAB was a thing (or at list pressing up to restore last command), but it was awesome nevertheless! I've added both TAB complete, and command history via arrow keys! Doki Doki Pasta Club. Really enjoyed this excuse for pasta puns! I only wished for tab-completion. IMHO This is an outstandingly fun game. Strongly recommended and top on fun and humor for me so far. Very cool concept and the OS looks superb, great audio, and its making me feel really hungry! Just gotta execute that spaghetti and meatballs now..